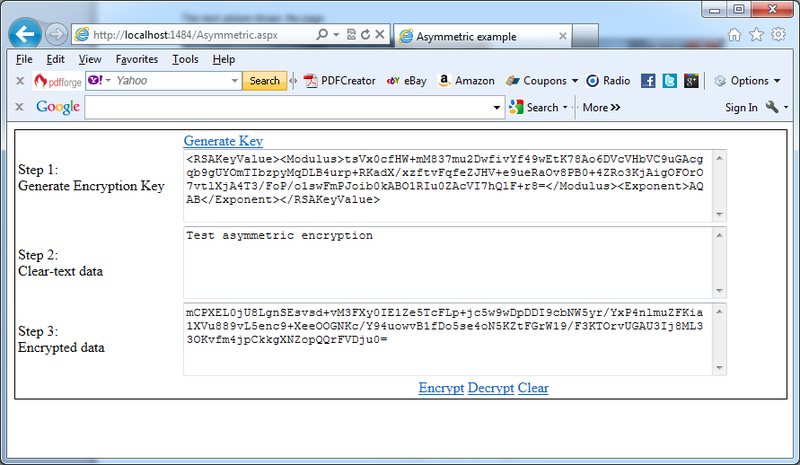 If you have to use asymmetric encryption in your ASP.NET project you can use the class described in the article How to create asymmetric encryption utility class in ASP.NET in VB.NET. To illustrate this you can create a page that permits you to generate a key and enter clear-text data through a text box. You can output the encrypted data through Convert.ToBase64String(). For decryption you should call Convert.FromBase64String() to get the encrypted bytes back and pass them into the DecryptData method.